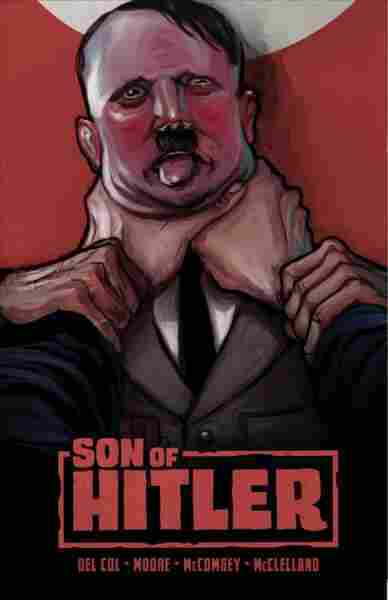 With Gonzo Flair, A New Graphic Novel Kills Hitler Anthony Del Col's gung-ho tale of a convoluted plot to bump off Hitler is jam-packed with beret-wearing Resistance fighters, frosty female spies and epic car chases — plus the dictator's secret son. From the get-go, there's absolutely no mystery about what kind of Hitler book Son of Hitler is — and isn't. When the cover features a closeup of the man himself grimacing comically as he's strangled (complete with wet protruding tongue), you know there's audacity afoot. Anthony Del Col helped create the anything-goes Kill Shakespeare series, and he and Geoff Moore have set out to inject a similar sensibility into the World War II spy genre. Son of Hitler includes plenty of standard elements — hulking stormtroopers, beret-wearing Resistance fighters, car chases through the cobblestoned byways of Paris, a frosty female spy with a fabulous forties hairdo — but it also tweaks the usual formulas. If it's not quite as unruly as it could have been, its gung-ho spirit is consistently infectious. The story starts out simple. In 1943 the aforementioned spy, Cora Brown, gets a lead on a potentially explosive piece of information: Where to find Adolf Hitler's illegitimate son. She immediately constructs a daring plan around this individual, guessing that his pedigree will give him a chance to make it past Hitler's phalanx of guards and get close enough to kill him. All she's got to do is find Hitler's son before anyone else does, ascertain his political leanings and, if he's of a mind to support the Allies, convince him to sacrifice himself in exchange for the assassination attempt of a lifetime. It turns out to be fairly easy for Cora to sign the son onto her plan. Pierre's mother was a prostitute, as we learn through an affecting flashback, and between the ministrations of back-lot bullies and the tut-tutting of neighborhood busybodies he's grown up into a human powder keg. Eager though he may be to find and end his father, his mission turns out to be fraught with complications. Some are to be expected of such a long-shot scheme, but there are others that no one could expect — or accept. The story rattles along at a vigorous pace, but it doesn't have as many twists and turns as it needs to sustain narrative urgency to the end. Fortunately, artist Jeff McComsey is on hand to bring action sequences to life and infuse some drama into the draggy parts. McComsey's style isn't what you'd expect in a World War II story: It's subtly kooky. In the past he's shown a penchant for drawing zombie apocalypses, and here it feels like he's got an itch to go nuts with cartoony exaggeration. Little things — a crinkly fizzle of car exhaust or an long pair of fingers holding a cigarette — betray a pen that's only barely being kept in check. But this is a World War II story, so that simmering energy is channeled into ferocious action scenes and visages that burst with feeling. 'Son of Hitler' may have its slow spots, but few war stories are this much fun. Well, some of the time they do. When McComsey's people are violently emotional — when they're being shot or strangled, for instance — their eyes go all crazy and their mouths writhe and contort in mesmerizing ways. Evildoers never lack appeal, either: The diabolical Dr. Morell has a couple of beautifully mottled closeups, and Hitler himself is oily and snakelike. But ordinary, ambiguous people in low-key circumstances tend to look wooden. McComsey's just not that interested in subtleties of expression. He models faces the same way he models a snarled bedsheet or a glass tumbler, playing up what's visually grabby. As with Del Col and Moore's story, there's a bit of a sense of opportunities lost. Even so, the opportunities the creators do take are plentiful, and they nail every one. Working in lovely tones of slate blue and sepia, McComsey uses white to build up shapes until they're practically tangible. His figures are taut assemblages of geometric precision and organic curves. Del Col and Moore's characters are vivid and dimensional; when Cora and Pierre's mission goes awry, it's genuinely painful (and not just because it goes awry in such appalling ways). Their humanity is nicely balanced against the story's shocking elements. Son of Hitler may have its slow spots, but few war stories are this much fun.